Stephen Colbert didn't waste any time in this interview with Anthony Scaramucci Monday night asking the former White House communications director about Donald Trump's response following Saturday's violence in Charlottesville, Virginia. "I promised you no gotcha questions, but I'm going to lead with one," the "Late Show" host said. "Nazis, good or bad?" This led Colbert to ask why Scaramucci thought the president would "shank a softball like that so hard" with his comments on Saturday rather than just condemning "the people who were there to start violence." Scaramucci echoed the words he used on ABC's "This Week" on Sunday, telling the CBS host that the president needed to be "way harsher" and "should've condemned white supremacism and Neo-Nazis." "It was late, I'm not going to say it wasn't, but he did go to the White House today and he did make a statement that was very declarative against it," Scaramucci said. He then added that the President is a "compassionate person," which led to boos from the "Late Show" audience. Scaramucci then later reiterated the point that Trump did condemn the Nazis on Monday. "Two days later," Colbert said back. "Does he order his spine on Amazon Prime? Why did it take so long?" The conversation between Colbert and Scaramucci was contentious yet civil leading the "Late Show" host to press the former White House official about his short time at the White House. "It's a tough place. There was a lot of infighting. 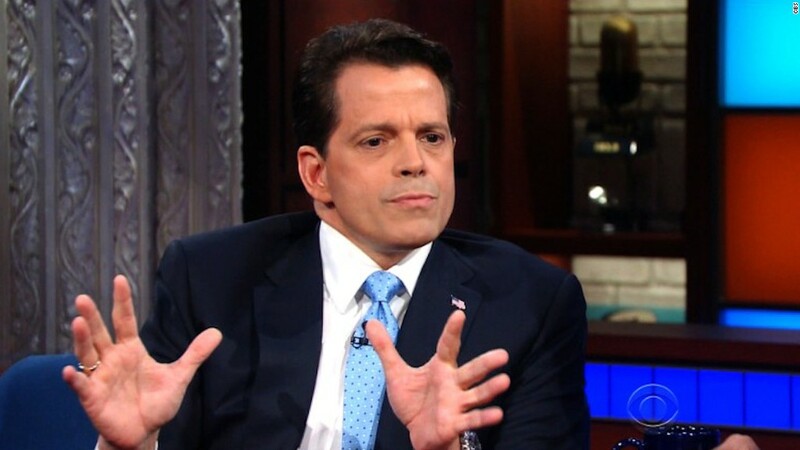 The front stabber was back stabbed," Scaramucci said remarking on a joke Colbert made a few weeks ago. "I have a tendency to be very open and very honest with people, what ends up happening there is people don't do that." Colbert then asked if Scaramucci was brought in to get rid of former chief of staff, Reince Priebus. "I don't want to say it that way," Scaramucci said, dodging the question. "Say it like 'The Mooch,'" Colbert joked. "So The Mooch from Long Island would say there's no love lost there," Scaramucci said. Colbert also talked to Scaramucci about Steve Bannon, asking if the White House chief strategist would be gone in a week. "That's up to the president," Scaramucci said. "Yeah, but what does 'The Mooch' think?" Colbert responded. "If it was up to me, he would be gone," he said. "But it's not up to me." The interview between the two ended on a jovial note with Scaramucci giving Colbert a knife in a case as a gift. "Now, listen, after he hit me so hard for three weeks he thought I was going to stab him with that," Scaramucci said. "That's why it's in the case."